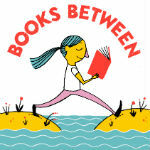 Hi everyone and welcome to Books Between - a podcast to help teachers, parents, and librarians connect kids between 8-12 to books they’ll love. I’m your host, Corrina Allen - a 5th grade teacher, a mom of two girls, and a new aunt!! A few weeks ago, my brother and his wife had a beautiful baby girl they named Nora and has been so wonderful to have a baby in the family again! But first I am excited to tell you that today’s episode is sponsored by MoxieReader - a literacy app that’s like a fitness tracker for your reading life. It gives teachers insights into their students’ reading, customized recommendations, and a way for kids to set and work toward their own reading goals in a way that is engaging and fun. My 5th graders and I have been trying it out over the past couple of weeks and they really, really loved it! They had armfuls of books they were excited to scan in and share with each other. I really feel like the end of the year is the perfect time to try something new that will energize your class and launch them into a summer full of reading. So head over to MoxieReader.com and try out their $7 for 3 months special by using the code welovereading! Also - Ann Braden and Jarrett Lerner have teamed up with some other educators to launch the #KidsNeedMentors project to connect authors with classrooms through book deliveries, postcard exchanges, Skype visits and lots more exciting things. Our special guests this week are Cordelia Jensen and Laurie Morrison - authors of the newly released middle grade novel Every Shiny Thing . Let’s talk about Lauren first since we meet her character first - as she is thinking about saying goodbye to her brother Ryan as her family is leaving him off at a therapeutic school for kids with autism. And we learn right away how upset Lauren feels about this. Laurie - can you talk a bit about any experiences you had or research you did to write your part of the novel? One of the things that’s been on my mind lately as a teacher and as someone who is always searching for books that are mirrors for children’s own lives is the impact of Adverse Childhood Experiences. And oh does Sierra have so many of those - her mother is an alcoholic, her father is in jail, and she is living with a foster family. Cordelia - how did Sierra’s character first come to you and how did you find that balance between her vulnerability and her resilience? There are two images in Sierra’s section of the novel that are so powerful to me - the kaleidoscope and the garden. That symbolism of Sierra’s and Lauren’s and all of our lives fragmenting and reflecting and then cycling back together…. One part of Every Shiny Thing that fascinated me was the Quaker school that the girls attend! And the Quaker values they study - can you talk a little but about that aspect of the book? Was the ending of the book different than how you first envisioned it? Alright, that wraps up our show this week! And thanks again to MoxieReader for supporting the podcast this month - definitely check out their website for an engaging way for your students to build their reading resume. If you are liking the show, please leave us some love on iTunes or Stitcher so others can discover us as well.